CHANTILLY LACE is a predominantly Crabbet mare who also qualifies as CMK. Her pedigree indicates linebreeding to SKOWRONEK through several sources, particularly FERZON and *RAFFLES. She represents the successful nick of AZRAFF and FERZON, a cross noted for producing National Champions in virtually every show division in which Arabians compete. Her pedigree has two lines to FERZON, two to the *RAFFLES daughter GAJALA, two to the inbred *RAFFLES stallion RAFGAR, and three to the *RAFFLES son GARAFF. There are some Polish imports in her ancestry (two lines to *WITEZ II and one to *CHLOE) as well as a bit of Egyptian through ROUF(75% Egyptian), *MALOUMA, and SAADINA. CHANTILLY LACE is by U.S. Top Ten Hunter TAJMA ZAR-RAFF, also a regional winner in show hack and hunt pleasure. He is a son of the top-siring *RAFFLES son AZRAFF, sire of 23 National winners and 48 producers of National winners. AZRAFF's get include U.S. National Champion Stallion GALIZON and Canadian National Champion Stallion COMAR BAY BEAU+++, both National Champion sires as well. TAJMA ZAR RAFF is a 3/4 brother to AZRANA, whose son MR MICAWBER sired Canadian Reserve National Champion Informal Combination, Top Ten Pleasure Driving and English Pleasure AOTR BEAU FIREBALL+/. TAJMA ZAR RAFF is a full brother to EL AZRAFFA, dam of Canadian National Champion Futurity Colt and Top Ten Western Pleasure Junior Horse W A SALUTE. 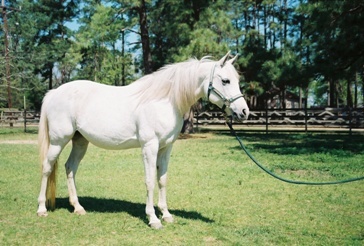 His dam, LEA GARYANA, is a paternal sister to Canadian Top Ten English Pleasure NA GANNA++ and to 3 National winner producers whose offspring include Canadian Top Ten Pleasure Driving C- MANORS MYTH(a 50% sibling to TAJMA ZAR RAFF as she is by an AZRAFF son), U.S. Top Ten Stock Horse and Canadian Reserve National Champion Native Costume LAW MI SEYN, and U.S. Top Ten Western Pleasure JOTR NA BINT YAGUTA. LEA GARYANA's sire COMAR GARIT is a paternal and maternal brother to National winners. Her dam RAMAYANA also produced AZRANA (already mentioned) and COMAR NIZZANA, the maternal granddam of U.S. Top Ten Hunter and Jumper ARABANA PIXANNE. CHANTILLY LACE's dam KY KHONFETTI also comes from a long line of successful performance horses. She is a paternal sister to 4 National winners: Canadian Top Ten Trail HA DA CHARISMA, U.S. Top Ten Stock Horse O MACS ROUFAL+, U.S. and Canadian Top Ten Stock Hortse TSHAWE ALLA ROU, and U.S. Top Ten Stock Horse ROUFERS CLEOPATRA. She is a 3/4 sister to U.S. and Canadian Top Ten Stock Horse KONA HAR-EL. KY KHONFETTI is by five time National winner ROUFER, whose titles include U.S. National Champion Stock Horse and U.S. Reserve National Champion Trail Horse. ROUFER is by GASSOUR, a product of the FERZON/GAJALA nick that produced 7 champions and 4 producers of National winners including Canadian National Champion Mare GA RAGEYMA and U.S. Reserve National Champion Stock GAJALA ETOILE, both National winner producers. ROUFER's dam ROUFA also produced ROUSHA, whose granddaughter WILLOWS MISS FIRE is the dam of U.S. Reserve National Champion Mare and National Champion Futurity Filly MAGNIFFICOOS JEWEL and U.S. National Champion Western Pleasure Junior Horse D ZALAMAAN. ROUFA's sire KAMADAN is a paternal brother to Canadian Top Ten English Sidesaddle and Native Costume SHAMADAR+ and to National winner producer RULITHA. ROUFA is a maternal sister to halter and western pleasure champion RITHANROUF and her dam RUAFA is a paternal sister to National winner producer KORINNE. KY KHONFETTI is out of KY KATYDID, a full sister to KY KHAROUSEL, dam of the winning racehorse EQUUS. KY KATYDID is a paternal sister to HAR-EL-FERZONA, dam of multi-National winner KONA HAR-EL, already mentioned. KY KATYDID is by the FERZON son HAR-EL FERZA, a 3/4 brother to GASSOUR. He is by FERZON out of halter reserve champion GALADI, also 3rd dam of 1988 U.S. Reserve National Champion Open Cutting KETESZA-K. GALADI is by National winner sire GAYSAR out of GAJALA, the dam of GASSOUR, who is the top producing daughter of *RAFFLES with 11 champions to her credit. KY KATYDID's dam CICADA also produced KY KHADJARA, dam of U.S. Top Ten Country Pleasure AOTR 40/Over and twice U.S. Top Ten Show Hack SIMPLY SAFIRE. CICADA is inbred to RAFGAR, *WITEZ II, and NAFA as she is a double RAFGAR granddaughter and her sire's dam is by a full borther to her maternal granddam. CICADA's sire NEJRAN sired Canadian Top Ten Futurity Colt THE PRODIGAL and several champion producing broodmares, he is a paternal brother to National winners in halter and performance and his dam is a full sister to a National winner producer. CICADA's dam SAFIEH is a full sister to the dam of a regional halter champion and is a paternal sister to National winners. SAFIEH's dam NITEZA is a halter champion, a full sister to Canadian Top Ten Stallion NAFASON++ and National winner sire NITEZ, and a 3/4 sister to 4 National winners including U.S. Top Ten Stallion NATEZ(sire of U.S. National Champion Mare INDIAN GENII) and U.S. Reserve National Champion Stallion BOLERO++(sire of U.S. National Champion Stallion BOLERO++).